Although DevOps is known as a method for more agility and speed in the development processes, the practical implementation is often still at the beginning. André Braun of NetApp gives valuable tips for the introduction of DevOps in his guest article in “E-Commerce-Magazin”. Voice commerce has long been considered the next big step in e-commerce, but so far there has been no big breakthrough. For example, only two percent of Amazon echo owners have already ordered products via voice control. Tobias Weidemann searched for the reasons for the restraint for “t3n”. As a local player that has been confined to the Los Angeles area so far, Yummy has an extremely exciting business model for online grocery. For Jochen Krisch and Marcel Weiß, this is a good reason to take a closer look at the company in the “Exchanges” podcast. 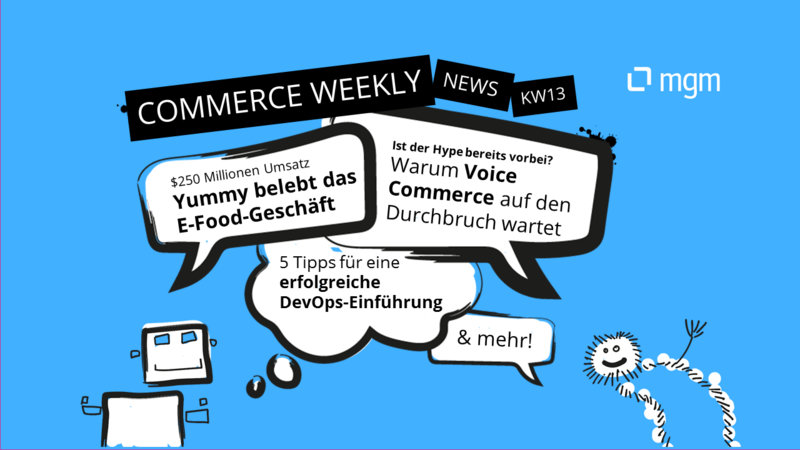 In addition to Yummy, Jochen Krisch’s blog “Exciting Commerce” also deals with other companies that could have a say in online grocery in the future. Accordingly, online pharmacies and pet food mail-order companies are developing logistics that are also suitable for grocery shipping. Introducing a new ERP system is a big challenge for many retailers. After all, ERP is often the foundation on which business processes are built. Nicole Wehner, Managing Director of MAC IT-Solutions, gives in her guest article tips how this challenge can be overcome. All optimizers talk about Booking.com: What makes it so successful? The travel booking portal Booking.com is currently one of the most successful platforms. But why is it so successful? In her article, Deniz Kilic highlights the formulas for success and explains what experiments and testing have to do with them. From the perspective of many experts, chatbots can become valuable supporters of customer service. However, they are still reaching some limits at the moment. In the magazine “Internet World Business” the five main problems are named. The large number of different online channels makes it difficult for retailers to occupy all relevant channels and network them sufficiently. Bernhard Ollefs, Managing Director of WEBWORKS, explains in an interview with ECC Köln how this can nevertheless be achieved. German online shops are technically at a good level – this is the result of a study by Applause, a company that investigated online shops in various countries. However, German retailers have some catching up to do in terms of their apps, personalization and omnichannel offerings. Which payment methods will determine e-commerce in the future? The consulting firm Sopra Steria now investigated this question in a study and came to a clear conclusion: the credit card in particular offers customers numerous advantages and will therefore probably continue to be of importance.